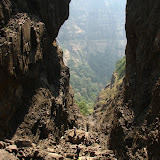 Hi, I have came across your blog while searching for Harishchandragad via Nalichi Vaat. Its really good, crisp and informative. Congratulations on being the person who climbed up through Nalichi Vaat. I know its been a long time. I had some questions and will be glad if you can help. 1) Is the route from Nali very obvious or tricky? (I know is tough). 2) Is proper Rock Climbing essential? Like with the ropes and all the stuff? or is it like at the top of Gorakhgad? 3) How much time does it take for group of around 8 to 10 people. 1. Yes the Nali is route is tricky, but for sane climbers, with some trekking experience and who are not afraid of heights and walking along edges, it should be fine. BUT NO trekkers who’ve got height problems or walking along edges is scary… For them they can’t do the traversing rock patches. 3. It took us around 7 hrs for a team of 5 from Belpada ( and all were fairly quick in climbing and walking ). The shorter the team, the better, but if you have a group of 8-10 with mixed experience levels, it could take around 8 – 9 hrs. depending upon the current condition and guys trekking along. Thanks a lot Ruturaj. I appreciate your help. came across your blog while searching for Harishchandragad via Nalichi Vaat and you have described it very nicely, very much informative. is there any parking facility in Sarwane, where you can park our 2/4 wheeler, or should we opt for public transportation? Is it feasible? Is food / water available once we reach the top or on the way? I had got down at Sawarne (near Police chowki, on the highway) by ST then had walked all along. I wouldn’t be the right person to advise whether private vehicles have full connectivity at that place. Abhishek, Belpada and Walhiwale are the same I guess.. Even in my blog I’ve mentioned that “… started to move in the dark to find ‘Walivare’ or Belpada. …” Yes, Google shows Walhiwale or something similar. Ofcourse you could keep asking villagers. Ok, reaching Belpada by evening might not be possible for us, so we are planning to get down at Sawanre around late night, stay there and start moving towards Belpada early morning next day. Hope it goes as planned. Thanks very much for your help. We are planning for this trek.We are going by public transport.So i wants to know that what time does it takes to go from Sawarne village to Belpada/Wlhivale Village?